Your worst fears have been realized. For as perfect as that couch looked sitting on the bright, roomy showroom floor, it’s not looking so fine resting outside your doorframe. It was undoubtedly going to squeeze through the door — or so you thought — and you’d soon be resting with your feet up, sitting on the newest addition to your living room. Yet sometimes life doesn’t go how you plan, and you’re left with a touch scenario. Instead of devising a plan to expand your doorframe or abandoning your purchase altogether, consider these tips for fitting that large piece of furniture into your home. Just because the measurements aren’t quite matching up, don’t panic. Your couch is likely soft and plush, and can surprise you with its ability to be squished through a doorway. If there’s cardboard or plastic protecting your couch, try removing it and seeing if it’s going to make a difference. Be careful, though – this makes your couch more prone to rips and tears along the way. Try removing the cushions, too. 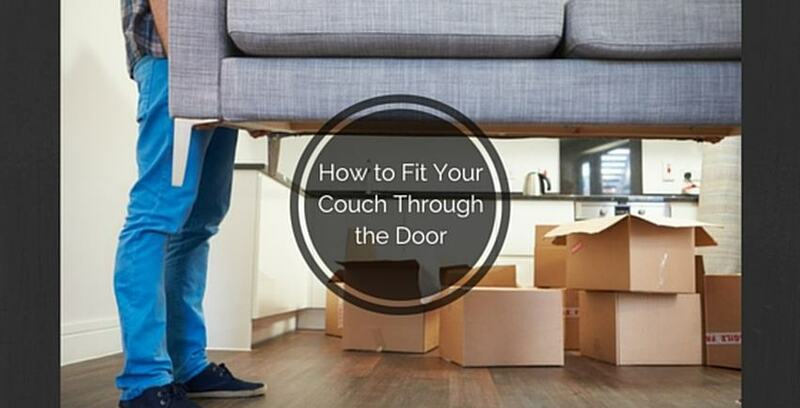 Your couch doesn’t have to fit through your doorframe in the way you first thought. Investigate all the different angles you can try, and don’t give up on an idea just because you don’t think it’ll work. Try it anyway. Sometimes, flipping the couch vertically can free up a little space. If your couch is small enough to try it, it’ll give you a little more room to maneuver. Sometimes, pieces of furniture will come apart. If your couch is one of them, you’re in luck. Even if that just involves taking the legs off the bottom, it’s worth a shot. If you’re desperate for answers and there are no signs of any luck, perhaps a professional could help you take it apart completely. Aha! The culprit of your misfortune may be the door itself. Your door isn’t as permanent as you might think, and can be fairly simple to remove. Try taking the door off, or consult someone who can help you do this. It might give you another inch or two, allowing your couch to fit through the opening. Does your home have any large windows? If you’ve exhausted the doorway as an option, start thinking of different entry points into your home. You might be surprised with what you find. Beware of navigating through stairways and tight corners, though, as they can be challenging obstacles. If you’ve decided there’s absolutely no way to fit your couch through the door, you’ve still got options. Ask the professionals if they can offer any advice, or consider selling it or giving it away to that relative going off to college for a while. Or, if you’d like to store it until you have a bigger space, Storage Direct can help. We offer a variety of unit sizes and secure, nationwide facilities. Contact us today to learn more!